The topic of Schnauzer colors is a controversial one. It divides the world of Schnauzer lovers right down the middle. We're really only talking about Miniature Schnauzers here, as Giants and Standards are virtually always salt and pepper or black. 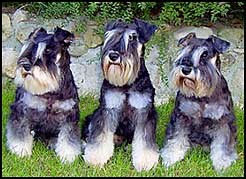 We're also talking mainly about the US as most other countries do not have exotically colored Schnauzers! One thing is certain and that is different colored schnauzers are becoming increasingly popular. So let's look at these colors and the general discussion in more detail. On one side of the debate are the Kennel Clubs and breed societies. They only accept the Miniature Schnauzer colors of pepper and salt, black or black and silver. I'm sure there's more - but you get the picture - there are many different Schnauzer colors currently being produced in America! There are quite complicated and scientific reasons (related to genetics and recessive genes) as to why there's so many possible Schnauzer colors. For the technically minded, there's an interesting research article on dog colors by Professor Sheila Smutz from the University of Saskatchewan. one of the original colors in Germany, where Schnauzers originate, was "gelb" - literally yellow - but more commonly taken to mean white. 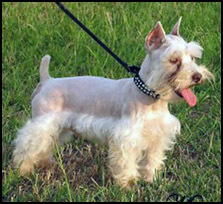 Colored Schnauzers - particularly white Schnauzers - occur naturally. They are part of nature and should be fully accepted. They say that they are responding to a market created not by themselves, but by pet lovers who are looking for that "rarity factor". Many claim that their multicolored puppies ARE recognized by the AKC in the sense that they are bred from purebred parents registered with the AKC. 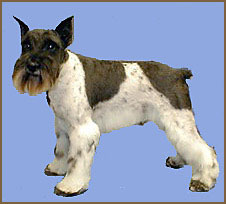 A colored Schnauzer may be registered with the AKC as long as both parents are also AKC registered. Although they cannot be shown under AKC or American Miniature Schnauzer Club rules, non-standard colors can still take part in in Agility, Obedience and Search & Rescue competitions. One of the main aims of the AKC and breed clubs - most notably in the US the American Miniature Schnauzer Club (AMSC) - is to try and protect the breed and keep it healthy by laying down a set of definitions or breed standards. They also claim that the rarity of colored Schnauzers has led to high prices and puppy farms producing unusual colors to make a fast buck - without any regard for genetics or the future health of the Schnauzer puppy. "This definition is what makes a Great Dane a Great Dane, a Poodle a Poodle, a Dalmatian a Dalmatian, etc. It is not up to each of us to decide that we would like to change each of these breeds because we like it or find it appealing. Adhering to these definitions is what retains the individuality of the breed. Breeding to the definition is the challenge for the breeder. A brown Dalmatian might be cute - but he is no longer a Dal; a tiny Great Dane would be more easily kept - but he is no longer a Great Dane, and a hard coated Poodle would be easier to groom, but he wouldn't be a Poodle. And in that same light, a white (or colored) Schnauzer is no longer a Schnauzer; he is disqualified because he does not meet the definition of that breed. The little white (or colored) Schnauzer is not 'bad'. He is simply not a good specimen of the breed. I would suggest that the person who likes a small white terrier seriously considers the purchase of a Westie. (By the way, the Westie wouldn't be a Westie if he were any color other than white!)" A further argument against breeding different Schnauzer colors is that the parents are selected purely for the color of the puppy they will produce, rather than taking other important issues - such as health and lineage - into account. Well, Should I get a Colored Schnauzer? That's not for us to say. 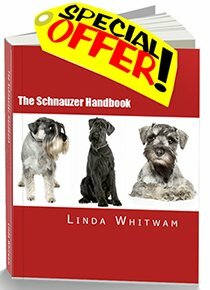 We're here to give you the independent facts on Miniature Schnauzer colors- it is up to you to make the final decision. However, if you are thinking of getting a Schnauzer puppy, we definitely recommend that you buy from a good breeder.